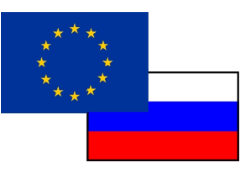 ROM Economics » News and Opinion » Who Would Win in a Fight Between the EU and Russia? This question that had until recently seemed like the property of war gamers, warmongers and the occasional historical reenactor, has now become part of the daily discourse surrounding the Ukrainian crisis. It is also impossible to address this debate without mentioning the EU’s dependence on Russia’s natural gas, most of which goes through Ukraine. Indeed too many commentators have swiftly declared that this dependence was and still is the deciding factor in the crisis. I disagree, we should not confuse correlation with causation, and in this case a series of geopolitical blunders by the US and the EU are to blame for Putin’s current winning hand – natural gas dependence is just a symptom of those mistakes. The often repeated claim in the recent news cycles that Russia has blindsided European and American politicians to take the geopolitical advantage is ridiculous. One cannot blindside people who are already blind, and being blind is the only explanation for allowing EU dependence on Russian gas to grow. There can be no doubt that Russia’s supply of natural gas (Liquefied Natural Gas, LNG), which accounts for around 30% of all LNG in the EU, is a massive deterrent to concerted action against Russian expansion. Putin’s sly but realist approach to geopolitics has ensured that Russia’s vast reserves of natural resources have become tools of state power rather than constraints. Even Hillary Clinton acceded to this view, creating the long overdue Bureau of Energy Resources for coherent energy and foreign policy approaches in 2011. But Putin doesn’t deserve all the credit for the current situation; strong arming, oppression, persecution, executions of political enemies and yada yada yada will only get you so far even in politics, and in this case the EU in particular should take a long look in the mirror. For years the EU commission has struggled to create a coherent energy policy and the consequences are finally hitting hard. Of course Germany has to be taken to task, especially when it comes to LNG now that its nuclear power production has fallen to 10% of total domestic production from a 22% high in 2010. Nobody could have predicted the tsunami or the Fukushima disaster thereafter, but the future consequences of phasing out almost a quarter of your energy production capability were clear for whoever bothered to look. It strikes this author as painfully ironic that popular assertions that civilian nuclear energy would be the death of us all have now brought us closer to an actual nuclear confrontation. A recent development of the crisis has been the US’s assertions (much to the delight of Republicans and their Keystone pipeline dreams) that it is ready to start exporting its own LNG to reduce everyone’s dependence on the Russian kind. This is a horrible development. The environmental impact of large-scale LNG production and exports aside (we’re now more likely to blow ourselves up before that ever becomes a problem), at the end of the day the difference between importing Russian or American gas is just semantics. Thinking short-term is how everyone got into this mess in the first place. Instead, it is imperative for the EU to have a coherent policy for future energy production and development. It is a great and slightly hilarious mistake that modern politicians have associated renewable and alternative energy with “peace-loving hippies” after millennia of statesmen struggling to protect their nations through resource self-sufficiency. We should come to terms with the fact that resources and security are indivisible issues until someone invents a tank that runs on wishful thinking. That’s not to say nothing good can come from this. It’s hard to disagree with the popular claim that the US’s future exporting of LNG will offer a direct competition with Russian gas, thus bringing down prices and alleviating any future LNG-based Russian threat. But that is completely missing the point. Russia can inflict pain on its neighbours because they are its neighbours. Its position as a major regional power means it does business with almost everyone around, and most of this is predicated on Russia’s ample natural resources. The US’s idea of pressuring their economic base through competition can be a nuisance if it fails or a disaster if it succeeds since their economy is likely to drag more than a few neighbours down with it once it crashes and burns. Destabilising entire nations is much easier than stabilising them as we should already be painfully aware, and yet western politicians seem insistent on repeating history. Now I know this is not a popular assertion, but hear me out. I’m not advocating abandoning Ukraine to its fate; that would have consequences of its own. Rather, those same “peace-loving hippies” might actually be right on this one (even if they were so horribly wrong on nuclear Energy). There’s nothing to gain from war with Russia at this point, and unless the situation escalates further there’s no point in an economic war either. Rather the EU should swallow a big pill of humility and admit its mistakes. Merkel in particular should acknowledge that she cannot be the EU’s de facto leader and Germany’s elected leader in an effective form while answering to domestic pressure every election cycle. Renewable energy production is growing, but not nearly fast enough, and with growing LNG production and increased fracking, lower gas prices make it unlikely that it will grow much faster anytime sooner. That’s the EU’s problem to solve, and it’s definitely not one to be ignored. Diversifying and increasing energy production in Europe will not only dull one of Russia’s main weapons, but will also increase the EU’s favoured arsenal of soft power. Meanwhile, the US should realise that Putin is unlikely to engage or even think in any manner expected of a Western leader. He is a classic power statesman, and is clearly aware of Sun Tzu’s assertion that one never engages one’s enemy at their strongpoint, so why does anyone expect him to enter the soft power field dominated by the EU and US? Instead the US is perfectly placed to engage Putin in a manner he understands, through demonstrations of force. This doesn’t mean the US can or should intervene militarily; resolving the situation peacefully needs to be the main priority. Putin is much less unpredictable than the media sets him out to be, and there is little doubt that the Crimea is solely a bargaining chip in his greater scheme. The EU and the US need to figure out what Putin is willing to accept in exchange. This might seem futile, but it could be a relatively easy means of gauging Russia’s priorities which would in turn be invaluable in quickly addressing similar crises in the future. Only then should the US begin strengthening NATO, pressuring its European allies to pick up the slack (unlikely but worth a try) and more importantly, support a West-leaning Ukraine. Not because of moral obligations (the time for a just intervention has passed) or even legal obligations (Hobbes would be proud of the UK’s and US’s dismissal of the 1994 Budapest Memorandum along with France and China’s amnesia regarding their contemporary unilateral assurances), but simply because it would be a relatively cheap investment. Perhaps the strongest of all the weapons in the American arsenal is the pervasiveness of Western ideals in culture and the capability to spread those ideals worldwide. A failed pro-West revolution by a no means distant neighbour does more to damage this cultural capability than Putin’s weapons ever could, and diminishes the likelihood of any future revolutions (Western or not) in places that might desperately need them. But perhaps even more important in the long-run (and as evidenced by all the American conservative news outlets praising Putin’s strengths), the US cannot afford to keep confusing loud talk with confidence. Letting Putin call Obama’s bluff on the “consequences” of invading Crimea was a mistake, but bluffing in the first place was the greater mistake. There’s no reason to antagonize Putin for no gain. A calm and effective demeanour can speak much louder than sabre rattling ever could. Instead, this is a good moment to ask Chuck Hagel for another budget review and see just how much it would cost to remind Russia that there is no competition, the US has already won. Posted in News and Opinion | Comments Off on Who Would Win in a Fight Between the EU and Russia?